Email marketers understand that the unsubscribe process is as much important as the opt-in process. The unsubscribe link included into each email is a must have for reputable email senders. However, some people still prefer clicking on “Spam” button if they don’t want to receive emails from you anymore. Maybe they don’t trust the sender’s unsubscribe process and see a spam complaint as a more trustworthy way to opt-out, or maybe they are just too lazy to search for the unsubscribe link in your email, or maybe for any other reason but you are likely to receive a number of spam complaints after each email campaign. And that’s normal. You should be worried only if the number of spam complaints exceeds the allowable threshold set by the ISP. That’s why a great idea is to sign up for ISP feedback loops if you are not signed up yet and monitor your spam complaints at a regular basis. Well, although some % of spam complaints is allowed and normal, why not try to reduce them to minimum? And now this is possible with your Hotmail contacts. 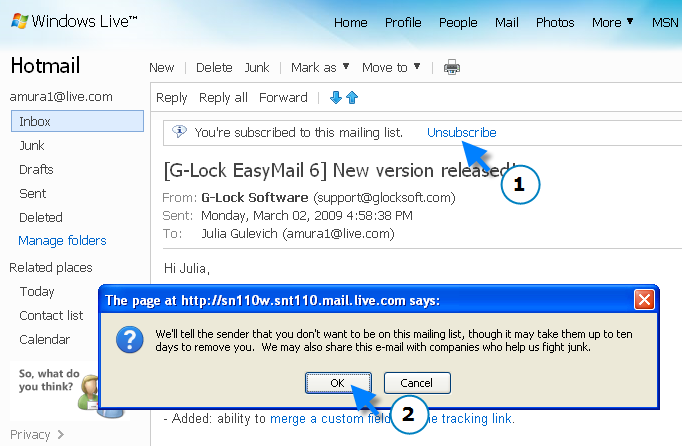 If you include the “List-unsubscribe” field containing your unsubscribe link into your email header, Hotmail will automatically add the Unsubscribe button to the user interface making your unsubscribe process easier and more trustworthy. Contacts who want to unsubscribe don’t need to parse your message searching for the opt-out link. They simply can’t miss the Unsubscribe option located in front of their eyes. 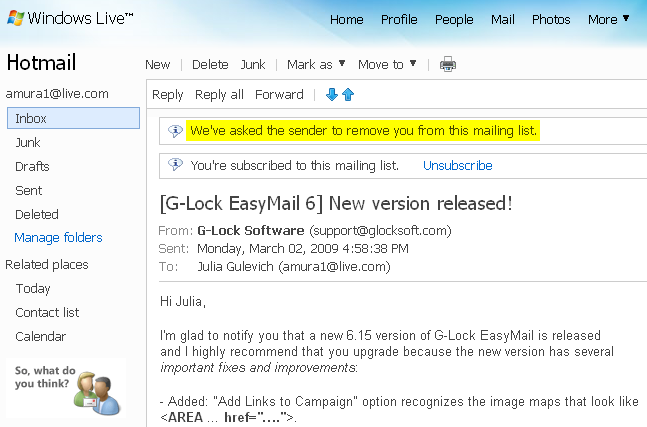 Let’s see what happens after your email with the List-unsubscribe field is received in Hotmail. When they click OK, they’re redirected to your unsubscribe page using the URL you specified in the List-unsubscribe field in the message header. It’s important that your opt-out process is really easy – no passwords, redirect pages, or multiple fields to fill in (a few fields to ask for an unsubscribe reason are OK). Below is an example of the opt-out form used by G-Lock Software. 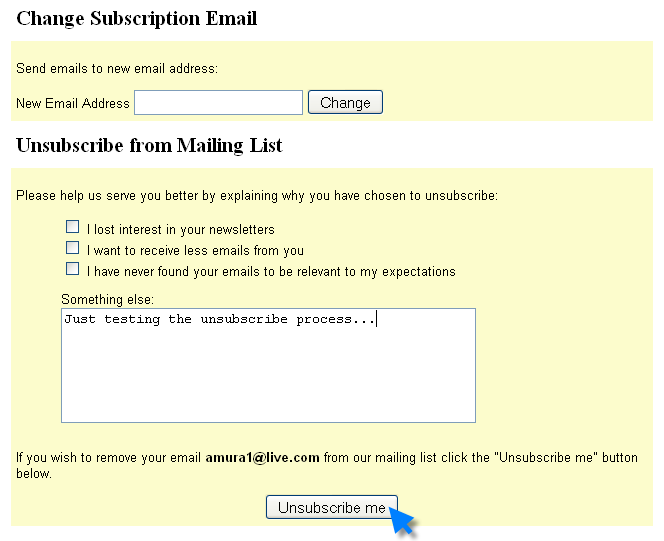 Probably it’s not ideal but at least, it gives you an idea of how the unsubscribe form should look like. So, after the contact goes through the unsubscribe process, Hotmail adds a notification to the user interface saying “We’ve asked the sender to remove you from this mailing list”. If you continue emailing to the contact who unsubscribed, Hotmail will add an alert to your email warning the recipient about an unknown sender. And the contact will have two options – “Mark as safe” or “Mark as junk”. This is one more argument for you to remove unsubscribed contacts from your list as soon as possible and stop emailing to them. Otherwise, your email risks to be marked as junk. How to add the “list-unsubscribe” field to the header of your outgoing emails? 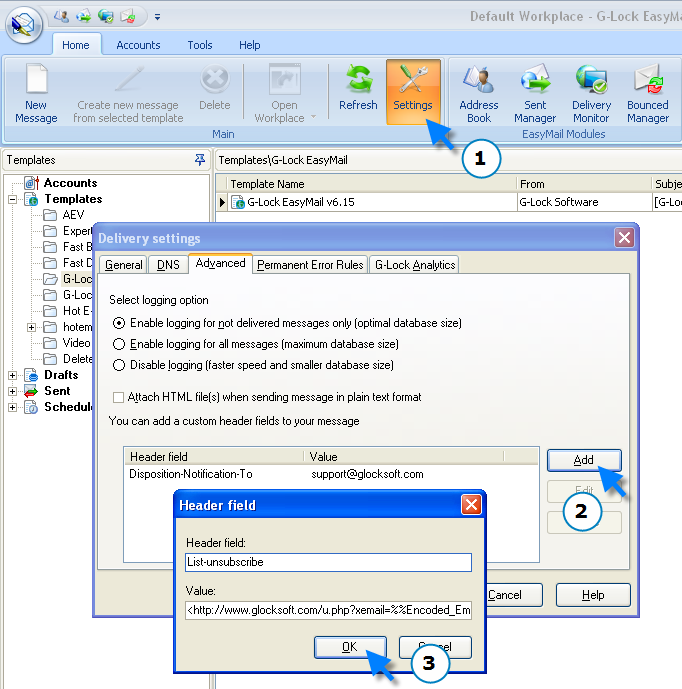 There is nothing easier if you use our email marketing software because G-Lock EasyMail allows you add custom fields to the email header. You need to type your own unsubscribe link in the Value field. 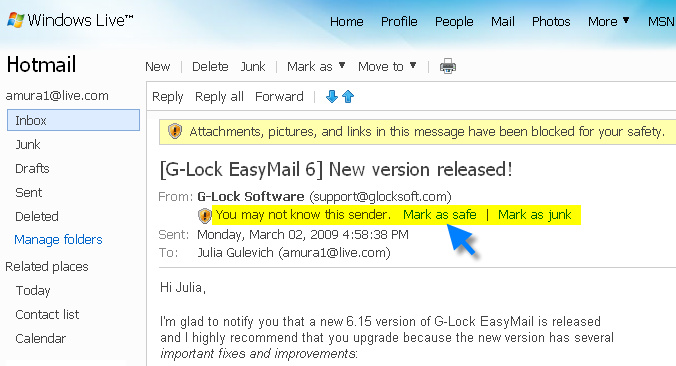 Click OK to add a new header field and then click OK to save the Settings in G-Lock EasyMail. You can send the email out and your Hotmail contacts will be provided with the most easy, trustworthy and convenient way to unsubscribe from your list. By now Hotmail is the only ISP that enables the Unsubscribe feature using the “List-unsubscribe” header field. It would be nice if other ISPs support the “List-unsubscribe” option too and I hope they will make it available soon.